Several of my recent blog posts have addressed various issues relating to our slow growing economy. In particular I have proposed a simple way to speed up economic growth: namely, broad-based tax reform at both the individual and corporate levels. The idea is to lower tax rates across the board, paid for by closing loopholes and shrinking deductions. At the individual level this could have the effect of putting as much as $250 billion per year in the hands of the middle and lower income wage earners who will surely spend most of it, thereby giving the economy a big boost. The U.S. corporate tax rate is not internationally competitive. In today’s New York Times the economics writer, Neil Irwin, has an article “Why Is the Economy Still Weak? 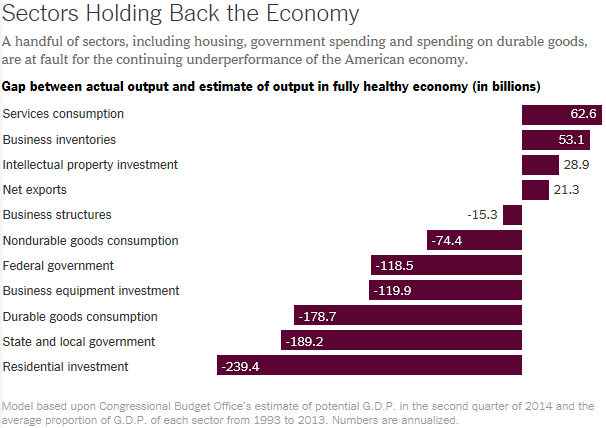 Blame These Five Sectors.” The five sectors are, in order of magnitude of effect: housing, state and local governments, durable goods consumption, business equipment investment, and federal government. See the chart below. Housing. Not at all surprising with 24 million people either unemployed or underemployed. Young people especially cannot afford to buy their first home today. State and Local Governments. These governmental units have to balance their budgets. When people have more money to spend, tax revenues will increase and so will public spending. Durable Goods Consumption. These same 24 million people aren’t buying much new furniture or many new cars either. It makes complete sense. Business Equipment Investment. Lower corporate tax rates will incentivize our multinational firms to bring their foreign profits back home for reinvestment. Federal Government. Unfortunately nothing can be done about this category! Federal deficit spending is way too high as it is and must come down. Conclusion: Using broad-based tax reform to put a large amount of money in the hands of middle and lower-income wage earners, and also reforming corporate taxes, will boost spending for four of the five main barriers to faster economic growth. Why don’t we do it? This entry was posted in corporate tax reform, economic growth, individual tax reform, Jack Heidel, Neil Irwin, New York Times, tax policy, tax rate cut, tax reform and tagged corporate tax reform, economic growth, individual tax reform, jack heidel, New York Times, tax reform by jackheidel. Bookmark the permalink. I agree with your suggestions Jack. But realistically until we have an administration that understands basic America economic theory without the injection of a progressive ideologue, we have what we have as to a stunted economy. You may be right but I hate to be so pessimistic. From a completely cynical point of view, it appears that the Democrats think they can escape blame for a stagnant economy. All they need to do, like Paul Krugman, is to constantly blame every-thing on the greedy Republicans. A lot of people will believe them. Whatever happened to decency and comity in public life?